US stocks continued to push higher on Thursday as global indices rebounded from the steepest correction in two years, boosted by the continued freefall in the US dollar index which slumped towards a three-year low with the yen firming to the highest level in 15 months. Commodities were firmer on the back of a weaker dollar, with gold pushing up above $1350 and pressuring historical resistance (see yesterday’s note), while WTI lifted 1.6% to back above $61 a barrel. The S&P 500, Dow Jones and Nasdaq rallied for a 5th day, closing the session up 1.2%, 1.2%, and 1.6% respectively. US T Bond yields meanwhile remained elevated with the 10-year holding above 2.9%. In economics news, first-time claims for US unemployment increased in-line with expectations in the week ended 10 February, up 7,000 to 230,000. The producer price index was up 0.4% in January after being flat in December, but the markets shrugged the buoyant data off. The Fed also released numbers showing a modest drop in industrial production in January, dipping 0.1%, although that was better than the downwardly revised drop of 0.4% in December. Yesterday’s CPI for January revealed a 2.1% increase that was above expectations of 1.9%. However, all of this failed to put a dent in sentiment as markets ‘acclimatize to a new reality’ of higher interest rates. The big question is just how much higher will rates go? I don’t think the 3% level on the 10 Year is going to represent much of a threshold, but north of 3.5% is a “different kettle of fish”. For now, the “ascendancy of the price of money” seems orderly and in a controlled fashion. But whether this remains the case looking further out is a question no one has the answer to. The “cost of money” is slowly – but surely – ascending around the world. The US bond market is leading the way, but others are following. 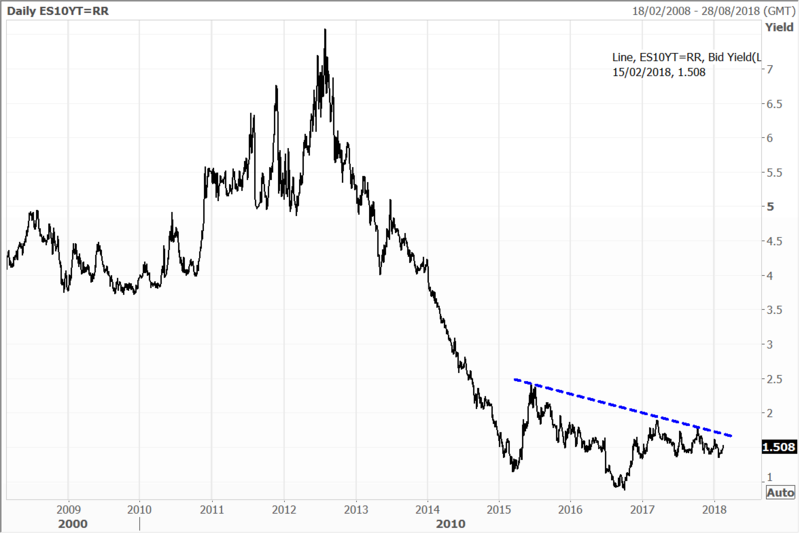 Other bond markets are going to follow. One of the hardest economies hit during the post GFC era was Spain, which had to face unemployment above 25% – which was a level last seen during the Great Depression. 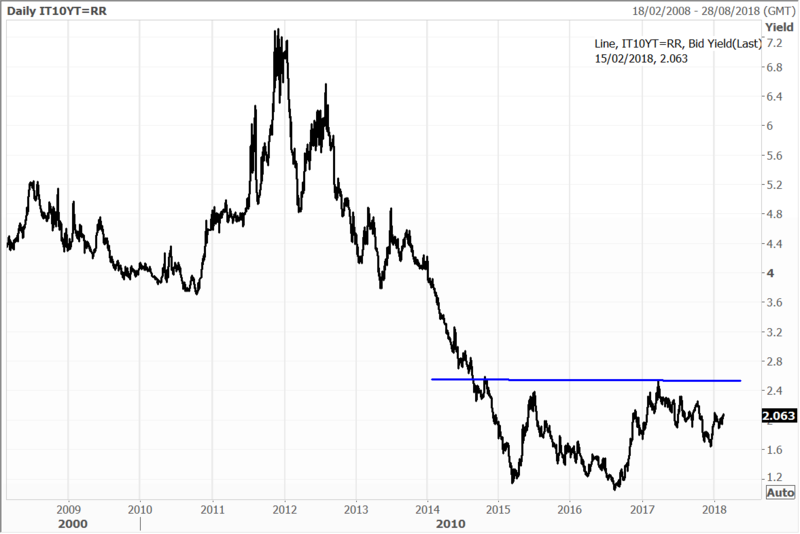 Whilst yields on 10 Year Spanish Government Bonds (see below) are yet to rise, the lows of 2017 will probably not be seen again any time soon as interest rates have definitively bottomed out. Chinese search giant and AI (artificial intelligence) pioneer Baidu extended gains, rising another 5.2% after a strong quarterly earnings report earlier this week. Baidu is a major holding in the Global Contrarian Fund. Asian stocks climbed on Thursday as investors shrugged off concerns that the Federal Reserve might hike short term interest rates more aggressively than earlier expected to combat inflation. Trading volumes were relatively low though and some markets were closed for public holidays. The megabanks we hold in the Global Contrarian Fund all climbed in trading yesterday, with Mizuho gaining 1.1%, Sumitomo up 1.7% and Mitsubishi UFJ rising 1.8%. A standout amid the financial sector was insurer Dai-Ichi Holdings, surging 5.0% after a strong profit result. Nissha Printing, another company we own, which manufactures components for smart phones, rallied 11% after reporting a huge increase in profit. Entertainment and technology conglomerate Sony, which also has a financial unit, gained 1.9%. Sony is held in the Global Contrarian Fund and Dai-Ichi in the Asian Managed Account portfolios. The Macau Casino operators gained ground, with Sands China up 1.6% after reporting a 31% jump in profits for 2017 in a preliminary filing (more on that later). Wynn Macau and MGM China were dragged upwards as well, rising 1.9% and 2.7% respectively. Hong Kong-listed Sands China closed 1.6% higher on Thursday after reporting some preliminary numbers for 2017. According to the filing Thursday, Sands China posted revenues of US$7.71 billion (HK$60.3b) in 2017, marking a 16.0% increase over 2016. Mass market gaming revenue grew 19% from 2016. A key contributor was the new Parisian Macau, with total casino revenues of US$1.26 billion. It was the first full year of operations for the Parisian, which has a half-scale Eiffel Tower as its feature landmark. The Parisian was the third largest revenue contributor for the group, after the top-performing Venetian with US$2.56 billion in revenue and the Sands Cotai Central at US$1.60 billion. Both the Venetian and Sands Cotai Central have more gaming tables and slots than the Parisian. Group adjusted property EBITDA – a key metric for the casino gaming companies – was up 16.4% to US$2.61 billion. Net profit surged 31.0% to US$1.60 billion. Sands China has the largest footprint among any of the casino operators in Macau, having been an early aggressive mover in what became the world’s largest gaming hub. To date, Sands has invested some US$13.0 billion into its Macau properties and covers nearly 13,000 hotel rooms and suites, 2.0 million square feet of retail-mall offering and 2.0 million square feet of MICE (meetings, incentives, conferences and exhibitions) capacity. It lagged peers with higher VIP exposure in 2017 as VIPs returned to Macau in droves, but we view it as well placed to participate in Macau’s evolution into a mass market tourism destination in the years ahead. Sands China has another US$1.1 billion of capital investment in the pipeline over the next three years, with the bulk of that going towards expanding, renovating and rebranding the aged Sands Cotai Central. It will be transformed into a new integrated resort to be dubbed The Londoner Macau. As with The Parisian and its Eiffel Tower, it will feature some of London’s most famous landmarks. In Europe most markets started off positively but faded towards the end of the day to finish with just modest gains. The pan-European Stoxx 600 advanced 0.53% for the day, while the Stoxx Europe 50 – which contains many blue-chip stocks – was up 0.59%. Miners performed solidly on the day, with BHP Billiton up 1.5%, Rio rising 2.5% and Glencore gaining 1.7%. Precious metals miner Fresnillo starred, surging 4.6%, while Randgold Resources edged up 0.9%. The market had a strong session in Australia on Thursday with the ASX200 lifting 1.2% to 5909. On what was a busy day for corporate earnings it was a sea of green across every sector, apart from the REITs. The resources sector was a particularly stellar performer with a gain of 3%. 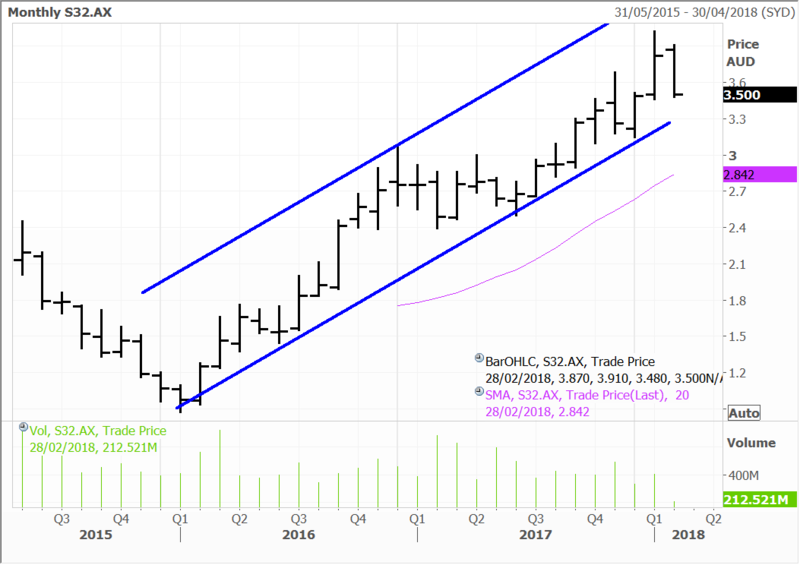 South32 came out with half year results yesterday, and from our point of view met our expectations on several counts, despite yesterday’s ‘buy the rumour, sell the fact’ 5% drop. Underlying profits of US$544 million were 14% higher than last year, and around US$20 million above median expectations. The manganese and alumina units are certainly firing, and were the biggest profit contributors. South32 is also returning more cash to shareholders than expected, with a 3 cent per share special dividend, and a total pay-out of 7.3 cents per share. South32 had pegged total dividends and buybacks of US$750 million by October, but has upgraded this forecast to US$1 billion. The cash pile of US$1.4 billion at 31 December was also more than the market expected. Oddly for all this, the shares took a step back, falling 5.4% on the day. Some have suggested that this was due to lower volumes, but this was already flagged to the market, and management have said production is now mostly tracking on or ahead of schedule. Cost pressures have also been present, but the company has also observed an improvement in margins at most operations. More likely in my view is some profit taking after a strong run over a medium-term timeframe. South32 is up 40% over the past 12 months, and has more than tripled in price since early 2016 (and around the time we were actively buying the stock). I think that South32 has more to give though, with some positive company specific and macro drivers. The de-merger of the company’s South African coal business will be one value add, while management’s plan to remove regional structures will deliver efficiencies. 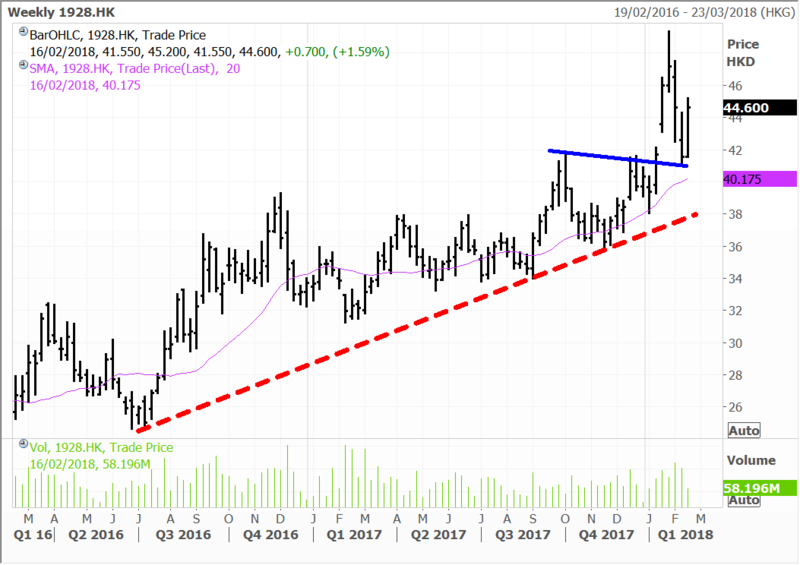 The company remains well leveraged to the next leg up in the commodities complex, and as CEO Graham Kerr notes “..it’s not very often we’ve seen a synchronised recovery in all our key markets. So I think that bodes well for the industry,” Spot on! We hold the stock in the Concentrated Australian, UK, and Mining & Resources managed account portfolios. Gold stocks were in the sun on Thursday, and Evolution also came through with a 10% rise in interim net profit to $122.52 million. As I have said previously, the company has a number of tailwinds going for it with production robust, and costs falling – all in sustaining costs fell to a record low of $785 an ounce, down 20% on the previous period. 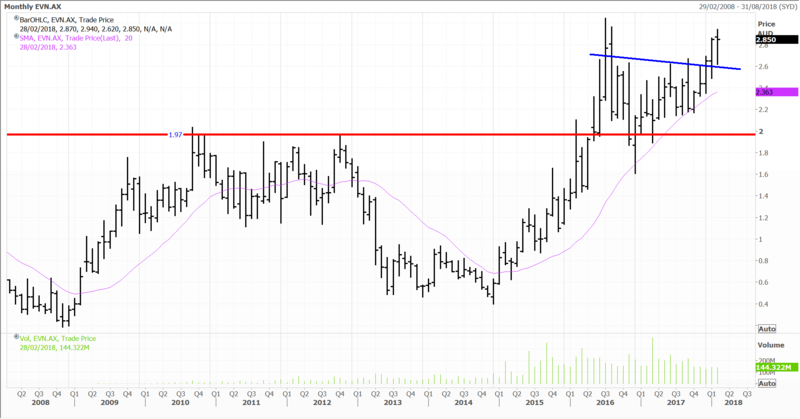 And margins are going to get even wider if we are right on the gold price. The stock which we hold in the Concentrated Australian Share, Mining & Resources and Small & Mid Cap managed account Portfolios, was up 2.2% on Thursday. 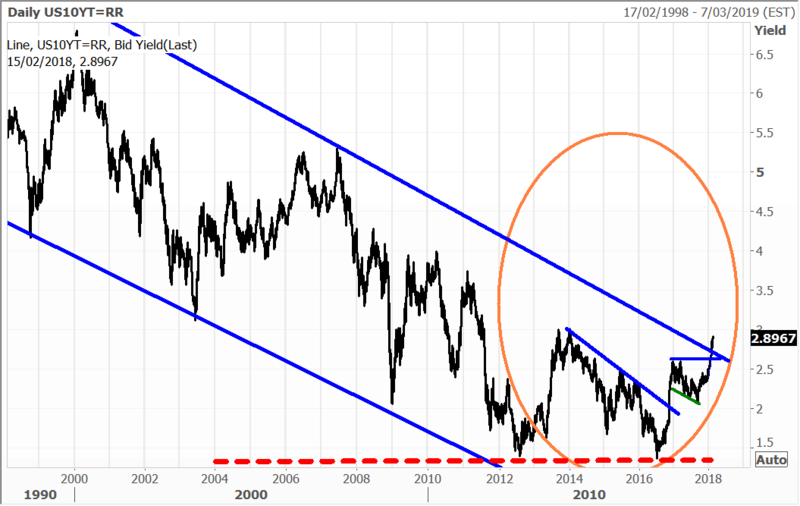 Disclosure: The Fat Prophets Global Contrarian Fund declares a holding in: Baidu, Mizuho, Sumitomo, Mitsubishi UFJ, Dai-Ichi Holdings, Nissha Printing, Sony, Sands China, Wynn Macau, MGM China, 10-year Bonds, BHP Billiton, South32 and Evolution.